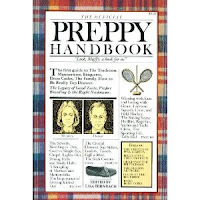 I grew up in the Upper Midwest in a most non-preppy family, but yes, I'm pretty sure I owned, or at least read, "The Preppy Handbook" when it was so huge in the 1980s. Parts of it could have been written in ancient Greek as far as my grokking it was concerned. Boarding school? Monograms? Squash? Trust funds? People named Biff and Chip and Muffy? This was not my world, but it was fun to read about. And now the original author, Lisa Birnbach, is getting together with the ultra-cool book designer Chip Kidd (please read "The Cheese Monkeys" if you haven't already) for a sequel. Apparently the new book will talk about how prep has changed, especially in these tough times. Which is good, because if I was confused by summer houses in the Hamptons and Ivy League colleges back then, they almost seem like a fantasy world belonging to the few blessed types now. Don't rub our noses in your rich families, is what I'm saying. Still, I'm interested in the section on black preppies, inspired by the Obamas. Apparently the original book had one black person pictured in the entire book. ONE. The NY Times article also linked to some prepster blogs, which I find fascinating. It didn't mention Melissa C. Morris, but it should have. Here are the two it mentioned: Summer Is a Verb and Monograms and Manicures. Again, not my life, not my world, but I'm still kind of secretly fascinated. Also: Here's a 1979 Atlantic Monthly cover story that kind of drove the wave. I can't wait to check out the sequel! I was tres prep in my high school days. Gold hoops in my ears, oxblood ballet flats on my feet, and in between, a huge collection of plaid wool skirts and monogrammed Shetland sweaters. After high school, I moved to England, started dating a guy in a band, and dove headfirst into punk, but there is, to this day, a certain set of friends who refer to me as "Muffy". Being from Minneapolis myself, I totally relate to being confused by most of the preppy traits in the handbook. You wore the shirt with all four collar flaps flipped up, of course. Strangely enoug I found this book at my parents' house at Christmas. It makes me laugh because the pictures are pretty much just amateur snapshots of real places in the Princeton/Lawrenceville NJ area--places I actually drove by on a daily basis in the 80s. I suspect the "models" are the authors' friends and family, too.